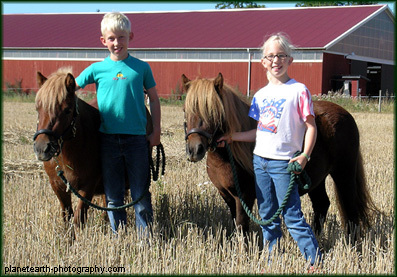 It is with great humbleness and respect for my fathers work that me and my family decided to take over the stud in January 2003 and continue to breed Furunäs ponies. The idea is to keep up the great quality, but in a smaller scale. Under Mares and Fillies & Colts you find the ponies we have on the stud today. We have chosen to keep six Furunäs mares at different ages and with different bloodlines, so that they can represent the Furunäs breed in a good way. From the first round of foals by Furunäs Fernando RS 258 we have kept two diploma mares, both gold winners: SUCH Furunäs Florita RS 3558 (Dam: Furunäs Benita RS 2736, elite- and gold winner), and A lincensed Furunäs Fergie RS 3582 (Dam: Furunäs Bonnie RS 2331, elite- and gold winner). Furthermore, we kept Furunäs Joybell RS 4879 (Sire: Roy v. Bunswaard RS 184, Dam: Furunäs Pomona RS 824, elite- and gold winner), and Furunäs Lisette RS 5151 (Sire: Flagg RS 85, Dam: Furunäs Ginette RS 3607, gold winner and ready for SUCH (Swedish Show Champion). These four mares are black. In addition, we kept two chestnut diploma mares: Furunäs Muzette RS 5351 (Sire: Furunäs Sahib RS 243, Dam: SUCH Furunäs Gazette RS 3983, a champion mare who has won several BIS), and Furunäs Nicolita RS 5152 (Sire: Hormesta Erik Viking RS 325, Dam: Furunäs Perlita RS 1435, elite- and gold winner). 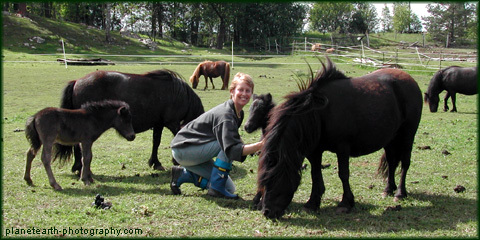 For a full list of all ponies bred at Furunäs Stuteri, please go to Sveriges Shetlandssällskaps Webstambok, click on 'Stamboksregister', enter Furunäs in the 'Namn' box and click on 'Visa resultatet'.